TS CETs to Start on May 2nd Cet Dates in Telangana ,TS Cet Schedule,TS CETs 2016 Dates/Schedule TS Eamcet 2016,TS ECET 2016 ,TS ICet 2016,TS Edcet 2016,TSPGECet 2016,TS LAWCET 2016,TS PGLCET 2016,TSPECET 2016 Exam Dates here under. Students Preparing for telangana Common Entrance Tests(Cets),better start revising their lessons as the Telangana State Council of Higher Education has started the ground work for various CETs. According to the fixture,TS EAMCET 2016 would be held on May 2nd,TS PECET onMay 11th,TS ECET 2016 on May 11th,TS ECET 2016 on May 12th,TSICET on May 19th,TS LAWCET and TS PGLCET on May 24th,TS Edcet on May 27th and TS PGECET on May 29th. Timing,Conveners,rules and regulations and other details would be announced later.The dates were announced by Telangana State Council of Higher Education(TSCHE) chairman T Papi Reddy at a press conference here on 5th Tuesday 2016. 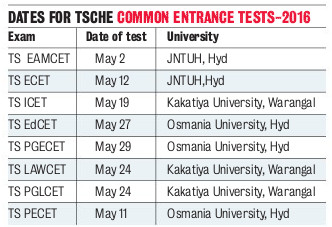 TSCHE's counterpart in Andhra Pradesh APSCHE,would also be conducting the cets in the month of May.The dates have been fixed leaving three days to a week time before or after the dates of AOSCHE,explained Papi Reddy. In 2015,a total of 90,556 applications qualified for engineering courses.While 72,794 qualified for Agriculture and medical courses.18,143 students cleared TS ECET,58,037 qualified TS ICET and 52,220 passed TS Edcet.